The objective of Super Lawyers is to create a credible, comprehensive and diverse listing of exceptional attorneys to be used as a resource for both referring attorneys and consumers seeking legal counsel. The Super Lawyers lists are published nationwide in Super Lawyers Magazines and in leading city and regional magazines and newspapers across the country, as well as the Kansas Super Lawyers Digital Magazine. 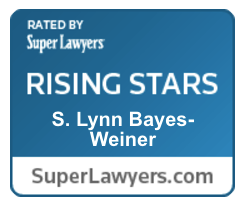 Please join us in congratulating Lynn Bayes-Weiner on her selection. For more information about Super Lawyers, go to SuperLawyers.com.